Ruskaia Pravda («Рускаа Правда»; Rus’ Truth [Law]). The most important collection of old Ukrainian-Rus’ laws and an important source for the study of the legal and social history of Rus’-Ukraine and neighboring Slavic countries. It was compiled in the 11th and 12th centuries on the basis of customary law. The original text has never been found, but there are over 100 transcriptions in existence from the 13th to 18th centuries. There are three redactions of Ruskaia Pravda, the short, expanded, and condensed versions, and the connections between them have not been completely analyzed. 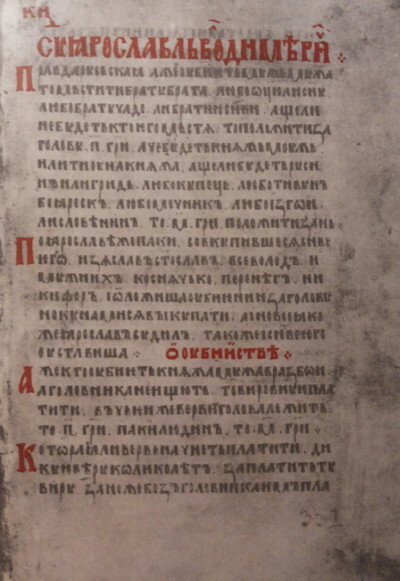 V. Tatishchev found the first short redaction in 1738 in the text of a Novgorod chronicle from the 1440s. This was published by A.-L. von Schlözer in 1767. Since then some 10 more copies of the short redaction have been found, including the so-called Academic and Archeographic editions from approximately the same period. 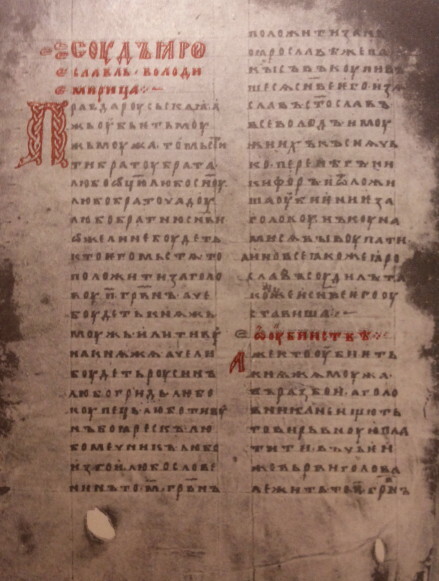 Of over 100 copies of the expanded redaction, the oldest are the Synodal edition, contained in the text of a Kormchaia kniga from 1282, and the Troitskyi edition, found in the legal compendium Mirylo pravednoie from the second half of the 14th century. The expanded Ruskaia Pravda was first published in 1792 by I. Boltin. The text of the condensed redaction differs somewhat from that of the two basic redactions. Its oldest version comes from a Kormchaia kniga of the 17th century. Most historians (eg, Mykola Maksymeiko, A. Zimin) believe that the condensed redaction is a shortened version of the expanded redaction, and that it appeared in the 15th to 17th centuries; M. Tikhomirov and others, however, claim that the condensed redaction dates back to the mid to late 12th century, and that it served as the basis of the expanded redaction. Noteworthy editors and publishers of the Ruskaia Pravda have been A. Musin-Pushkin, N. Kalachov, P. Mrochek-Drozdovsky, Mikhail Vladimirsky-Budanov, Vasilii Sergeevich, Serafim Yushkov, and Boris Grekov. Ruskaia Pravda was published in German by G. Ewers (1814), E. Tobien (1843–4), and Leopold Karl Goetz (1910–13); in French by M. Szeftel and A. Eck (1963); in Polish by I. Rakowiecki (1820–2) and A. Kucharski (1838); and in English by George Vernadsky (1947). Studies of the Ruskaia Pravda and attempts to systematize its redactions have been published by N. Kalachov, Vasilii Kliuchevsky, Vasilii Sergeevich, Leopold Karl Goetz, and others. Nikolai Karamzin studied its sources, particularly the influence of Byzantine canon and Byzantine law on the code. N. Kalachov and V. Kliuchevsky saw it as a clerical work, based on customary law and intended for church judges in civil cases. Others have detected the influence of Bulgarian law of the 9th and 10th centuries. Soviet historians (such as Boris Grekov and L. Cherepnin) have used Ruskaia Pravda chiefly as a source of understanding social relations in Kyivan Rus’; it has also been used to analyze the Kyivan Rus’ culture (B. Romanov) and to study the internal history and content of specific legal norms (Serafim Yushkov). The 43 articles of the condensed redaction of Ruskaia Pravda are divided into four parts: (1) ‘Pravda Iaroslava’ (or ‘the oldest part,’ as it is called by historians [eg, Vasilii Sergeevich, Aleksandr Presniakov, M. Tikhomirov] who do not agree that Ruskaia Pravda was initially promulgated by Yaroslav the Wise), consisting of articles 1–18; (2) ‘Pravda Iaroslavychiv’ or ‘Ustav Iaroslavychiv,’ consisting of articles 19–41; (3) ‘Pokon vyrnyi,’ which defines the penalty for murder (art 42); and (4) ‘Urok mestnykam’ (art 43). (See Mest’). ‘Pravda Iaroslava’ dates from ca 1016 according to some historians, or from the 1030s according to others. The decrees in this section are as old as the 8th or 9th century, particularly those dealing with blood vengeance. ‘Pravda Iaroslavychiv’ was composed at a conference of Yaroslav's sons, Iziaslav Yaroslavych, Vsevolod Yaroslavych, and Sviatoslav II Yaroslavych, in Vyshhorod in 1072 (according to M. Tikhomirov, Serafim Yushkov, and L. Cherepnin) or in 1032–54 (according to Boris Grekov and A. Zimin). The articles of this section carefully define and defend the interests of princes, government officials, and private property. The varying fines for murder (see vyra), depending on the victim's social rank, point to a differentiated society. Most norms of the short redaction are devoted to the protection of life, health, and property. The expanded redaction of Ruskaia Pravda, consisting of 121 articles, was the most widespread. There is considerable disagreement in dating it: according to Serafim Yushkov and A. Zimin, it was compiled during the reign of Volodymyr Monomakh (after 1113); according to Boris Rybakov, during the reign of Mstyslav I Volodymyrovych; and according to M. Tikhomirov and L. Cherepnin, before 1209. In the criminal law of the expanded redaction blood vengeance was replaced by monetary fines and state penalties called vyry. If the criminal could not be identified, responsibility for murder was placed on the community in whose territory the crime occurred. Besides compensation to the victim, a state fine was imposed for assault and insult. Serious crimes, such as horse stealing, robbery, and arson, were punished by banishment and seizure. Ruskaia Pravda also contained a number of very clear laws on civil issues, such as loans, interest, land disputes, and wills, and on procedural matters, such as witness testimony, oaths, and ordeal. Most of these issues were also covered in the condensed redaction. Ruskaia Pravda was a legal code of great importance, as can be seen from the abundance of copies that have been found. With the exception of the most privileged strata in the society, all free citizens were protected by the code. Its main purpose was to provide individuals with the power to defend their right to life, health, and property and to provide courts with the basis for a fair judgment. A characteristic feature of Ruskaia Pravda is its evolution toward a more humane law system. Ruskaia Pravda is also an important source of historical information on the administration of Kyivan Rus’, social differentiation, financial affairs, and agricultural technology. It is an indispensable source for the study of customary law and Princely-era legislation. It had a direct influence on Lithuanian-Ruthenian law and the Lithuanian Statute and an indirect influence on the Code of Laws of 1743. Some evidence of its influence can even be found in the legal codes and systems of other Slavic nations, especially in the codes of the Polish king Casimir III the Great (mid-14th century). According to the historian Fedir Leontovych, however, its influence on medieval Muscovite law is doubtful.